Jonatha Brooke On Mountain Stage Hear the singer-songwriter's return to Mountain Stage in this 2016 performance, which features the Mountain Stage Band joining in for the Woody Guthrie-penned "You And I." 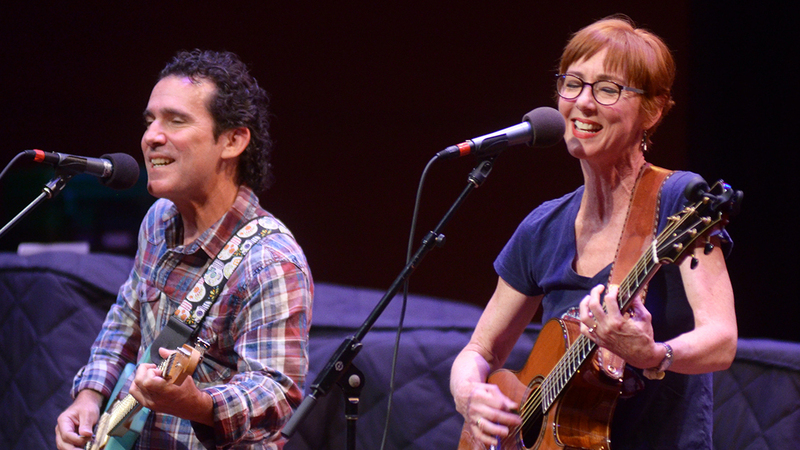 Established singer-songwriter Jonatha Brooke returns to the Mountain Stage, recorded live in Harrisonburg, Va. Brooke first performed on the program as part of the ethereal-yet-dissonant pop duo The Story, during the 1990s coffeehouse music wave. With years of solo work (and even playwriting) under her belt, Brooke's enunciated tones and intimate storytelling continue to have a pull on fans; just ask Katy Perry, who received Brooke's autograph in 2002 and then collaborated with her on the song "Choose Your Battles" nearly a decade later. Needless to say, the unflinching closeness of Brooke's singing and songwriting both startles and captivates, enough to make even the toughest person empathize. Jonatha Brooke's latest release is Midnight. Hallelujah., available now on Bad Dog Records. Joining her in this 2016 performance is Sean Driscoll on guitar; the Mountain Stage Band joins in on the Woody Guthrie-penned "You And I." "Are You Getting This Down?"